On a communal level, when individuals allow themselves to live from a place of vulnerability and authenticity, communities grounded in empathy and connection are brought to life. I’m grateful to witness this wholehearted way of living in Nablus and particularly at TYO where the local staff and volunteers radiate warmth, love, joy, and openness. Despite the plethora of challenges that can deter them, the staff and volunteers continue to show up and do their part to foster a space for current and future generations of youth and women to be themselves and envision a more hopeful future. As an intern, I’ve also felt graciously welcomed at TYO as a part of the community here. I will always remember the thoughtful gifts I’ve received from locals-from my favorite dessert to scarves and flowers--as reminders of the warmth and generosity I’ve experienced in Nablus. 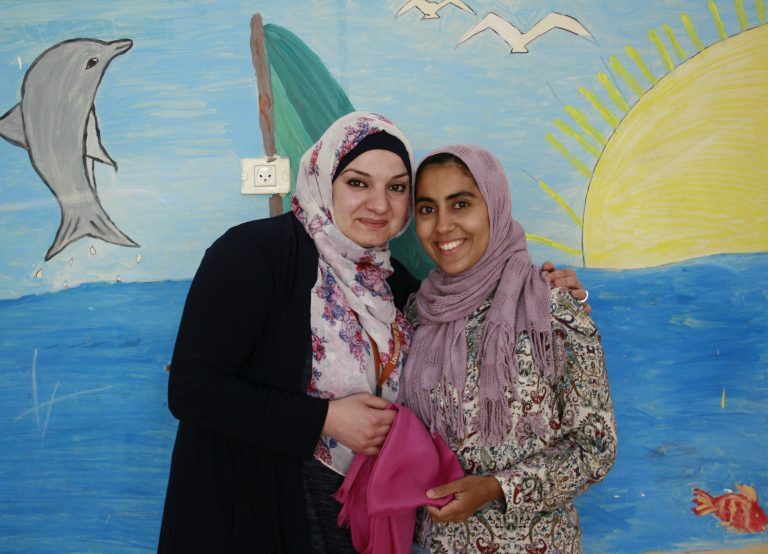 TYO Core Teacher Fawz and Haya spend time together in a Core classroom. Before coming to Nablus, I knew that I was in store for a challenging but rewarding experience at TYO, and surely enough, I’ve found myself growing and being challenged in unprecedented ways since my arrival. Here at TYO, the educational programming provided for youth and women is centered around empowerment and holistic well-being, which includes mental and emotional health education. While children and youth here learn about concepts such as respect and cooperation, they are also taught how to acknowledge, understand, and embrace their emotions. While watching my students learn about emotion, I’ve also been re-learning how to connect with myself and feel safe with my emotions, an inner landscape that had previously been uncomfortable territory for me. Being surrounded by the wonderful staff here has also been teaching me to be open with myself and to not let the daily stresses of work and life get in the way of finding joy in the small things. There is so much more that I have been gaining from my experience at TYO than I could ever imagine. It is said that the longest distance one will ever journey in the world is the 18 inches between one’s head and heart. I’m grateful for my time at TYO for teaching me how to ease into my heart and practice a more mindful, joyful way of life.